How To: Pre-Heat your oven to 350 degrees. In a mixing bowl…separate your egg whites, but add 2 yolks back, add protein powder, flax, wheatgerm, and chopped nuts. Mix with spoon or hand mixer, just enough to blend all the ingredients together. 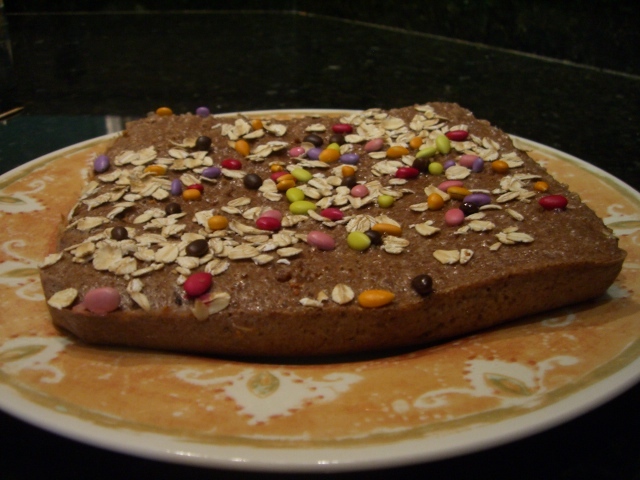 Line a 9×9 inch cake pan with parchment paper, spray the paper with non-stick cooking spray. Pour the mixture onto the parchment paper in the pan evenly. Take the cut up prune pieces and evenly space them in the mixture in the pan – pressing them down so that the mixture covers them. Sprinkle optional garnish on top and bake for 20 to 25 minutes. Some people out there have no love for Salmon. NONE! I tell you. In fact, the world is full of “Salmon Haters”. It’s a cryin’ shame! My feeble fish-lovin’ mind lacks the comprehension necessary to understand such “Fisdain”! I mean what’s NOT to LOVE!!!!???? If properly prepared, it should NOT have a “Fishy” flavah, which is most often voiced Salmon Haters complaint. The KEY is the SUPER HOT skillet that has SUPER HOT Olive oil in it! I can’t stress that factor enough! To test the oil temperature to ensure it is indeed hot enough, you might throw in a piece of diced onion. 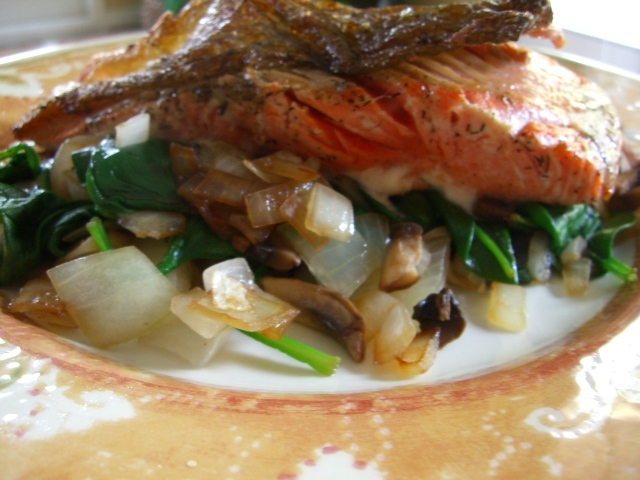 If it sizzles immediately, then your good to go with adding the Salmon to the pan. Place the fish SKIN SIDE on the pan (so that the fish flesh is what you see). That’s right just step away, or set a timer for 5 minutes and come back (I mean don’t go far) but just DON’T touch the fish until the 5 minutes are up! After the 5 minutes, test the fish using tongs or a spatulah to see if it can be EASILY flipped. If not, leave it in the pan and after another minute test it again. The fish will tell you when it’s ready to be flipped. If it’s releasin’ from the pan easily, then it’s ready. Why so adamant? Well, this will ensure you get a nice, crispy skin and will also make your pan cleanin’ easier. Once flipped cook for 2 to 3 minutes depending on how “done” you like your Salmon. I’m a “Medium to Rare” kinda Salmon girl. 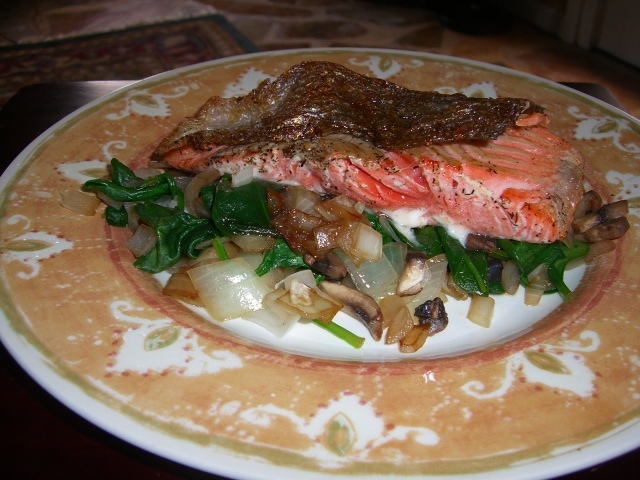 You’ll notice in the pictures that I have placed my 5 Star Salmon on a bed of sauteed Onions, Mushrooms and Spinach. My mouth is watering just typin’ about it!! Train Hard and Keep Your Fork Lifts Clean!! Have you ever heard the expression “Get out of Your Own Way”? Too often people approach goals with a crippling mindset from the get-go and as a result increase the difficulty of the challenge they set for themselves. A mountain climber wouldn’t train to climb a mountain and then on the day of the climb add 500LBs to their backpack. Not only is placing negative thoughts within the mind the equivalent of “adding 500lbs to the backpack”, instantaneously increasing the severity of the challenge, this kind of negativity sabotages success. Obviously, a challenge to accomplish something for the first time, or change behaviors will push the individual out of their Comfort Zone, hence the term “Challenge”. So, yes, there should be an established level of difficulty, which in actuality begins as the “Motivator” to pursue the goal. Moving forward the individual should take the first step in their Plan of achieving the desired outcome and in order to “get out of their own way”, adopt the mentality to “Embrace the Process”. Ease Into It & Make It Fun! 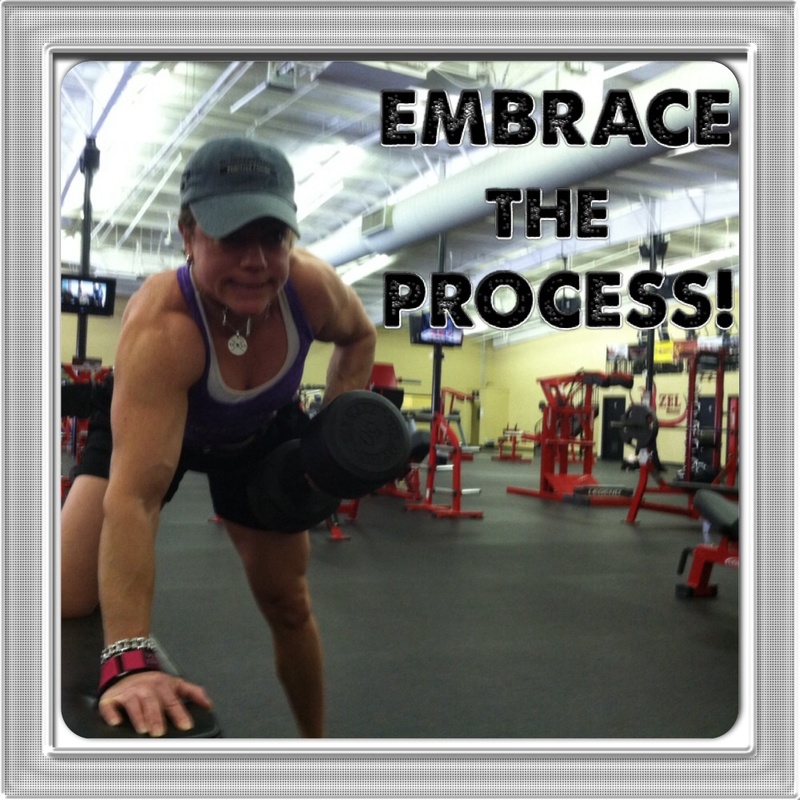 The moment the mind is set to “Embrace the Process” the level of difficulty becomes less severe. Accepting rather than fighting the necessary steps to achieve success will make the “Challenge” more enjoyable, thus in a sense simplify the task at hand. Attacking the Challenge with the attitude that this will be Fun and result in a Positive Change is a sure fire way to reach success, not just one time, but Every Time a goal is set! Most Personal Challenges are not achieved in one day. We may accomplish a “Mini Victory” within one day, but attaining the ultimate goal requires a compilation of “Mini Victories” over the course of several days, leading into months, and in some cases years. In this vein of thinking, and in reference to the two prior Motivation Study Posts, this is why the upfront preparation for mapping out your Plan to achieve Success is so critical. As this Personal Quest progresses, unexpected hurdles and internal conflicts (lack of confidence, pushing through physical pain, etc.) can conjure up doubts and questions within our minds, which in turn make us wonder “How do I Stay the Course?”. When this sort of occurrence takes place ( it’s not a matter of “If” …we’re human it’s gonna happen…) you and I have to dig deep within ourselves, tap into our own internal strength, remind ourselves WHY we started this journey, find ways to further break down the process into smaller segments, celebrate the “Mini Victories” to keep ourselves amped up, and envision how AMAZING gaining Success will feel. The Mapped out Success Plan is a great visual aid to use when going through the mental exercise described above. Relying on our own internal strength in this manner can be the empowerment that pushes us past the struggle and gets us back on track, but surrounding ourselves with positive people who know and support us in our quest can be another great source of strength to Stay the Course. Success and Nothing Less. That MUST be the Mindset when setting any goal. There is NO looking back, NO excuse, NO alternative. This commitment level to SELF has to exist in order to keep our “Eyes on the Prize” and moving toward claiming that Prize. The next post within this Motivation series will discuss how to make Extreme Personal Challenges easier to achieve. 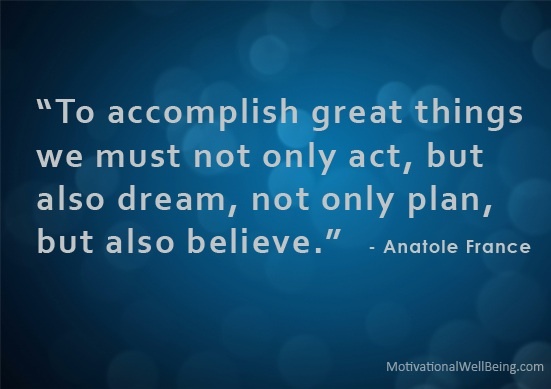 Okay, so you’ve taken the first action step and mapped out the PLAN for achieving your goal….Right???!!! No??!! Well, the PLAN is the KEY FACTOR to obtaining success. No one PLANS to FAIL. But when we Fail to Plan it essentially solidifies an outcome of failure. This concept sounds so OBVIOUS, yet so many of us still attempt to achieve a goal by just “Wingin'” it. The Plan doesn’t have to be some immensely complex document. In fact, simplifying it can be very beneficial in avoiding the Purpose Paralysis mentioned in Part I of this study on Motivation. Regardless, we need a Plan that acts as a Road Map and provides step-by-step directions for us to navigate toward and ultimately reach Success. We also need to build in a measure of Plan Flexibility. While certain aspects in reaching success will be black and white, other portions may require tweaking…especially if they aren’t providing outcomes that will accomplish the final goal. Another thought to consider when we begin to formulate our Plan is to seek counsel from someone who has already attained the level of Success upon which we have set our sights. Experiencing this type of consultation will shorten our learning curve by increasing our awareness and as a result will allow us to avoid pitfalls and other obstacles. Finally, we have to BELIEVE within the depths of our Soul that we CAN SUCCEED!!! Seek good counsel to Formulate a PLAN. Search your Soul for the Belief.